When in doubt, add some texture! Honestly, there are so many reasons to get a textured mani. First of all, you get to constantly touch and endlessly play with the texture on your nails. It’s addictive so don’t tell us that we didn’t warn you. So, let’s talk a bit about your options when it comes to textured nail art. We are officially in the #babyitscoldoutside season, so make sweater nails your priority. The term explains everything. Besides sweater to keep you warm in this cold weather, you also need sweater nails to match your actual sweaters. This nail technique includes delicately applied gel in a cable pattern shape. If you want to be extra, take your favorite sweater at your nail lady and ask her to dress your nails in the same sweaters. After all, nails deserve a decent sweater in this cold weather. You know the drill from now on – a snap from your matching sweater and nails is a must for Instagram. You can combine this technique with different motifs. 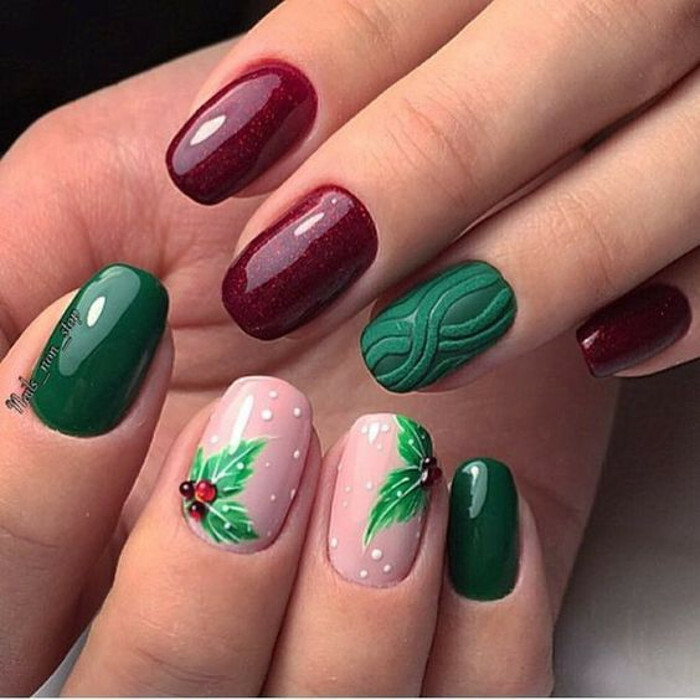 Since the holidays are approaching a holiday or winter-inspired nail art would be perfect for this time of the year. Another option to add texture to your manicure is 3-D nail decorations. Everything from small stones to caviar manicure will add dimension to your nails. If you are a glamorous chic, a nail art that features rhinestone embellishments would be your favorite. There are so many options that is hard to make up your mind on one. You can combine these decorative elements with other nail techniques, spice up a simple mani with them or go full glam and cover your nails with dazzling stones. For those who think outside of the box, a snakeskin textured manicure might be the best option. The colors don’t necessarily need to match, but the texture has to. Your nail lady needs to shape the gel in a way that will look like snake’s skin. To put all the accent on the texture cover your nails in one color. A shiny black snakeskin mani is bold gals’ favorite. Bonus tip: a stiletto nail shape is the best option for snakeskin textured mani. You can also add texture to your nails with chunky glitter or regular glitter if you prefer a smoother effect. Glitter is a holiday staple, so now is the right time to flaunt glitter textured nail design. For more inspiration flip through our gallery of textured nail designs and pin your favorite ones for later. Celebrate your love for the winter holidays with this fun textured nail art.